Set off your kicked-back cool with the modern style of the Converse Kids Color Blocked Slim Fit Jogger. 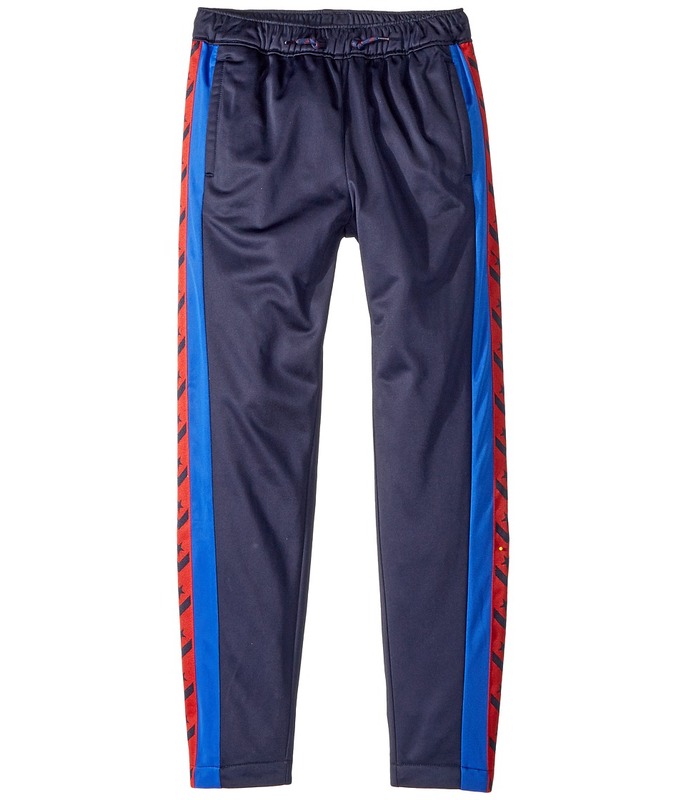 Jogger sweatpants feature a slim fit that tapers lightly through the leg. Cotton-poly fleece boasts bold, colorblocked stripes at the left leg. Elastic waistband with a tunnel drawstring. Zip hand pockets. Back patch pocket. Gathered, rib-knit cuffs. 55 percent cotton, 45 percent polyester. Machine wash and tumble dry. Imported. Measurements: Waist Measurement: 26 in Outseam: 39 in Inseam: 27 in Front Rise: 11 in Back Rise: 13 in Leg Opening: 5 in Product measurements were taken using size LG (12-14 Big Kids). Please note that measurements may vary by size. 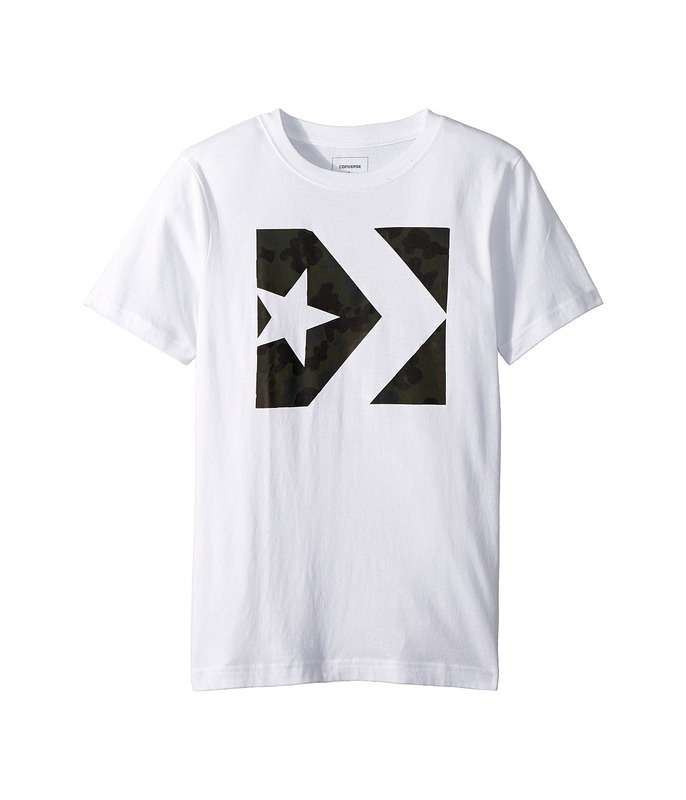 A stylish Converse Kids Star Chevron Wordmark Tee is the perfect t-shirt for carving through a half-pipe. Regular fit. Crew neck. Long Sleeves. Graphic print branding on left chest and the length of both sleeves. 100 percent cotton. Machine wash cold, tumble dry low. Imported. Measurements: Length: 18 in Product measurements were taken using size 5 Little Kids. Please note that measurements may vary by size. 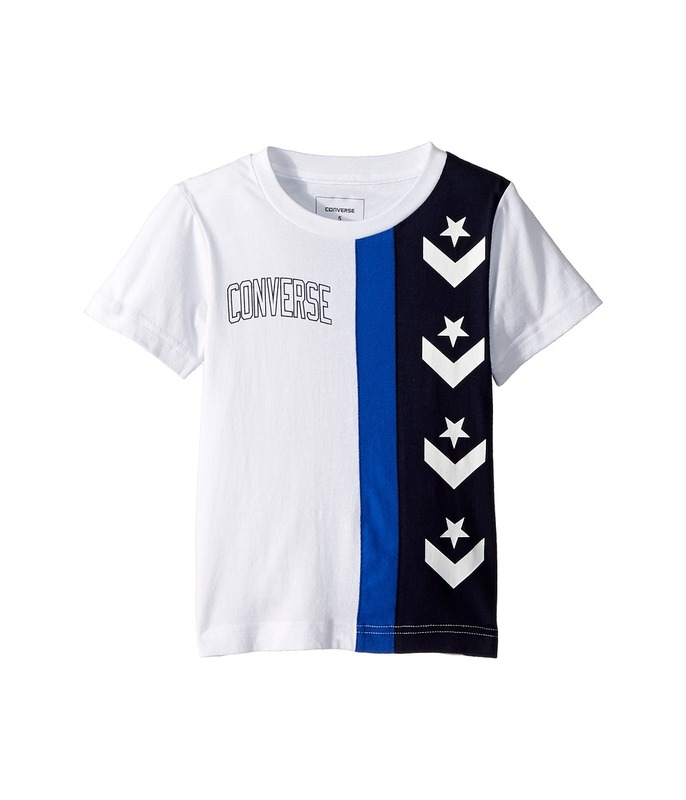 Change up the game with the signature cool of the Converse Kids Star Chevron Stripe Tee. Pullover T-shirt in a comfortable jersey knit. Stripes fill the iconic Star Chevron logo print. Crew neck. Short sleeves. Straight hemline. 100 percent cotton. Machine wash and tumble dry. Imported. Measurements: Length: 17 1 2 in Product measurements were taken using size 5 Little Kids. Please note that measurements may vary by size. 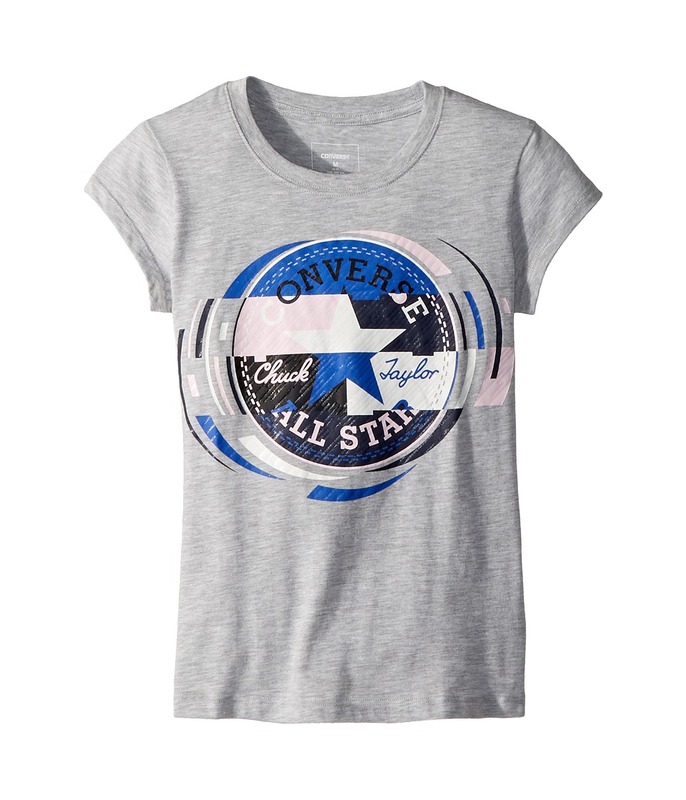 The Converse Kids Star Chevron Stripe Tee is a modern, stylish take on a classic t-shirt design. Regular fit. Crew neck. Short sleeves. Color block striped design. Graphic print branding in front. 60 percent cotton, 40 percent polyester. Machine wash cold, tumble dry low. Imported. Measurements: Length: 22 in Product measurements were taken using size SM (7-8 Big Kids). Please note that measurements may vary by size. 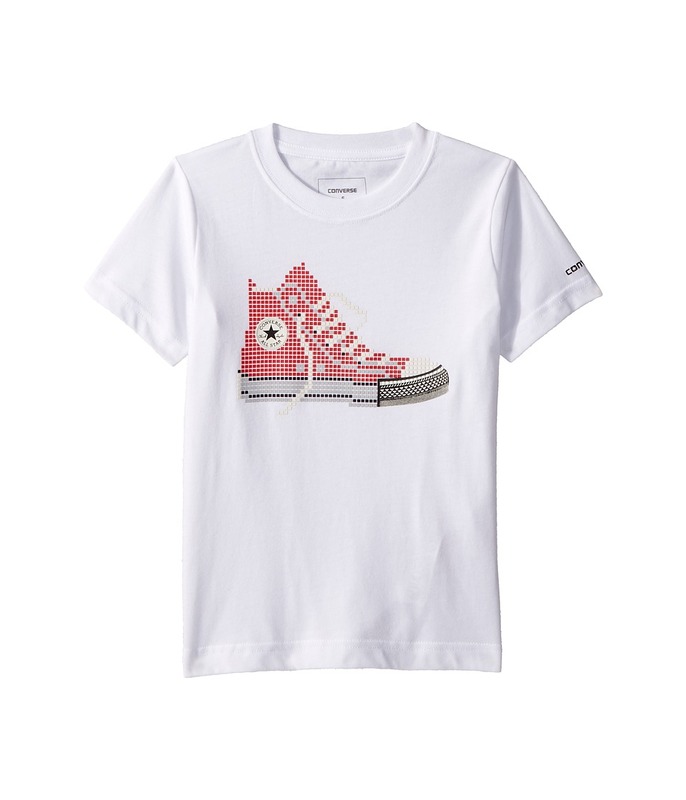 Let your true colors shine through in the Converse Kids Color Reveal Chuck Patch Tee. Pullover T-shirt in a soft, lightweight jersey knit. Dot pattern sets off the classic Chuck Taylor print. Self crew neck. Short sleeves. Shirttail hemline. 60 percent cotton, 40 percent polyester. Machine wash and tumble dry. Imported. Measurements: Length: 22 in Product measurements were taken using size SM (7-8 Big Kids). Please note that measurements may vary by size. 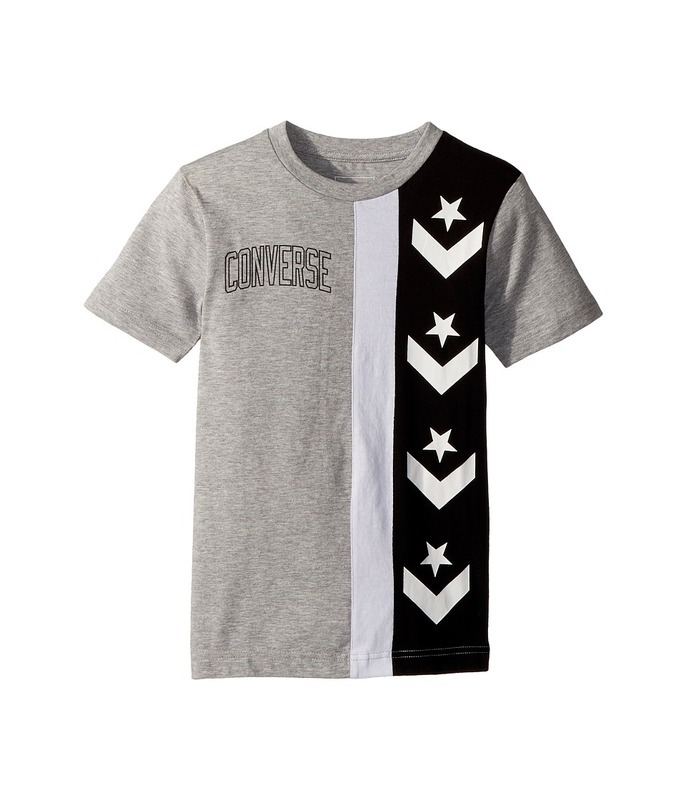 Get lost in the game with the Converse Kids Seasonal Star Chevron Tee on your back. Pullover T-shirt in a camouflage-printed jersey knit. Star Chevron logo print across the chest. Crew neck. Short sleeves. Straight hemline. 100 percent cotton. Machine wash and tumble dry. Imported. Measurements: Length: 26 in Product measurements were taken using size LG (12-14 Big Kids). Please note that measurements may vary by size. 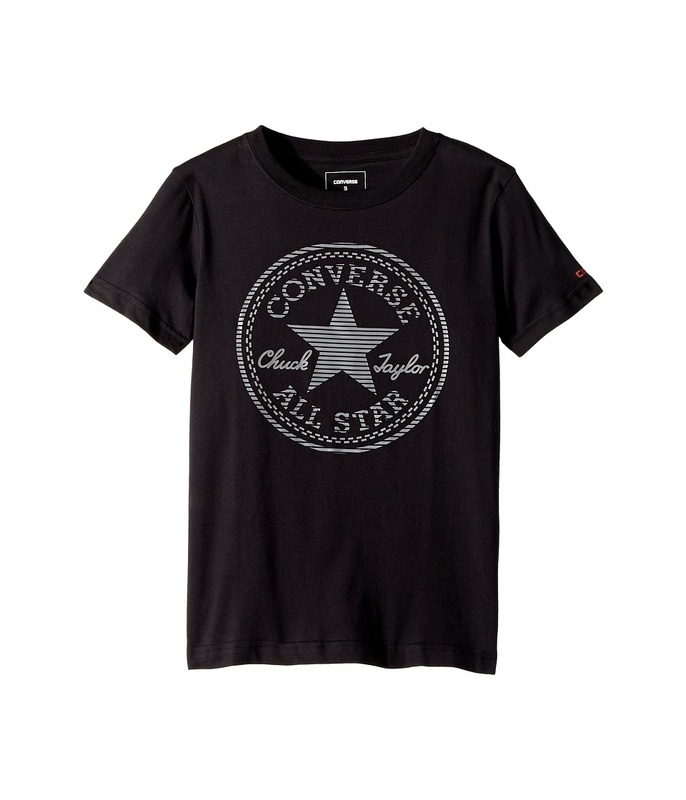 Help your little skater tackle the skate park in style with this Converse Kids Pixel Chuck Tee. Crew neck. Short sleeves. Rib-knit collar. Large graphic print design in front. Branding on left sleeve. 60 percent cotton, 40 percent polyester. Machine wash, tumble dry. Imported. Measurements: Length: 18 in Product measurements were taken using size 5 Little Kids. Please note that measurements may vary by size. 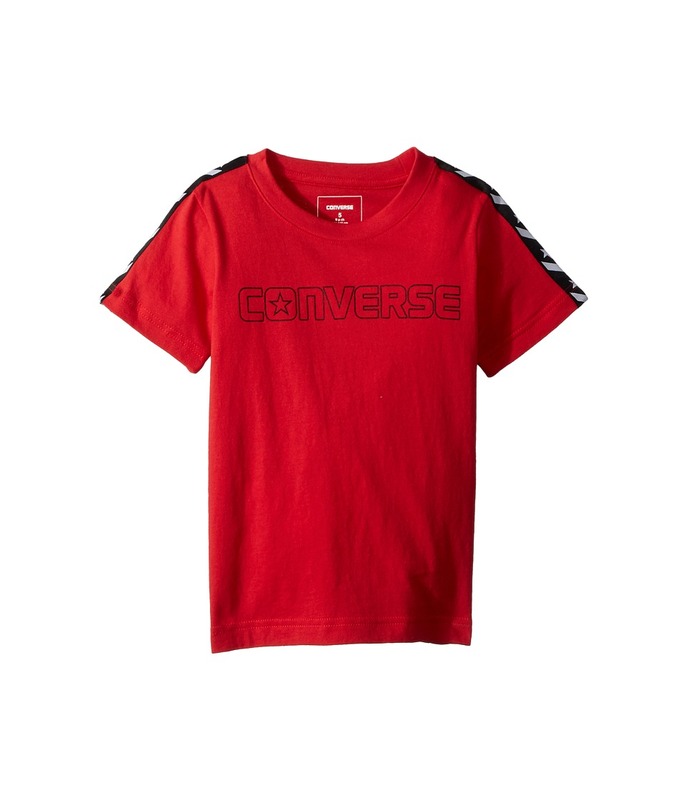 This Converse Kids Pixel Chuck Tee is a comfortable t-shirt that~ll let your little one tackle the skate park in style Crew neck. Short sleeves. Rib-knit collar. Large pixelated Hi-Top graphic print brand design at front. 100 percent cotton. Machine wash, tumble dry. Imported. Measurements: Length: 22 in Product measurements were taken using size SM (7-8 Big Kids). Please note that measurements may vary by size. 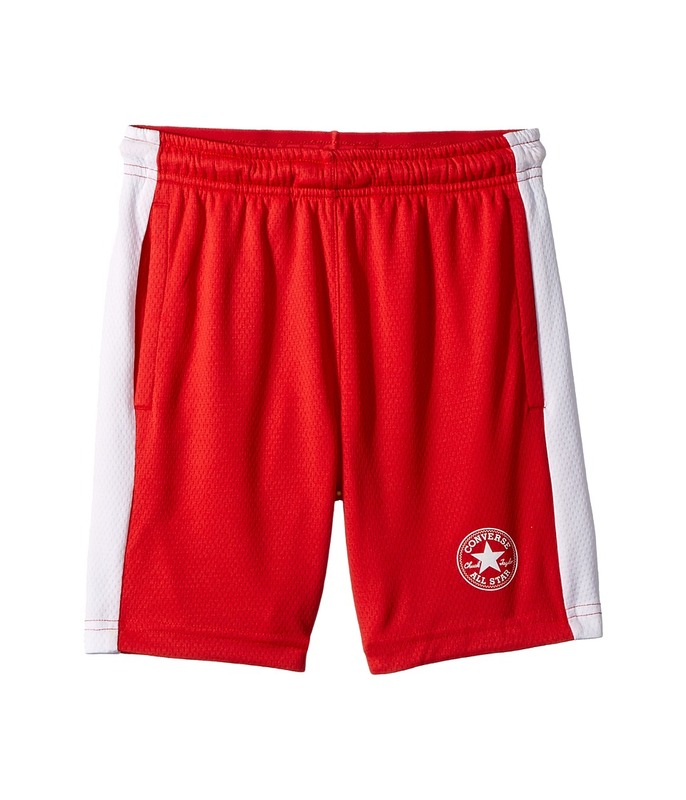 Take sport style from the court to the streets with the Converse Kids Mesh Shorts in your kit. Pull-on shorts in a lightweight, solid mesh knit. Contrast stripes set off the rib-knit waistband. On-seam hand pockets. Back patch pocket. Chuck Taylor patch placed at the left leg. 100 percent polyester. Machine wash and tumble dry. Imported. Measurements: Waist Measurement: 19 in Outseam: 11 in Inseam: 3 1 2 in Front Rise: 7 1 2 in Back Rise: 9 1 2 in Leg Opening: 6 1 2 in Product measurements were taken using size 4 Little Kids. Please note that measurements may vary by size. 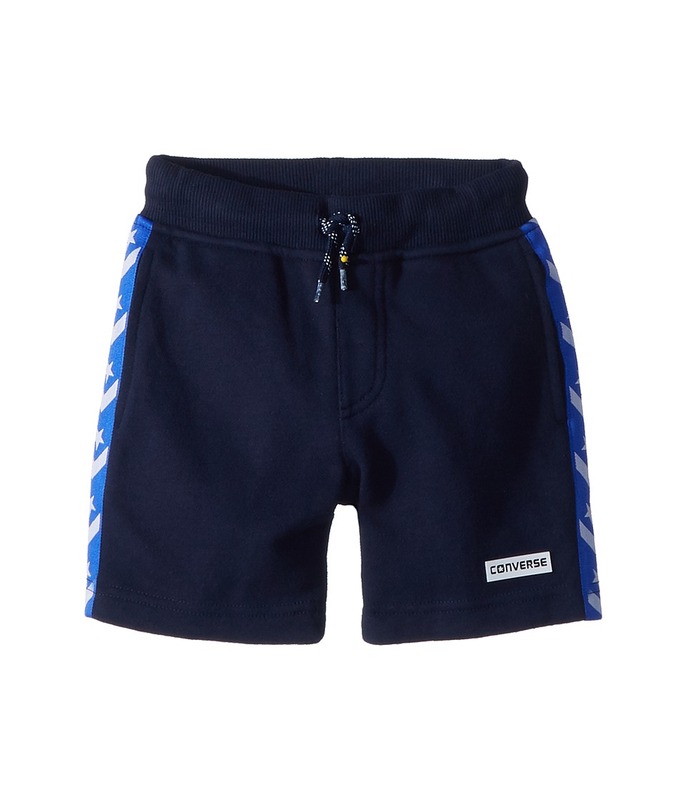 Take sport style from the court to the streets with the Converse Kids Mesh Shorts in your kit. Pull-on shorts in a lightweight, solid mesh knit. Contrast stripes set off the rib-knit waistband. On-seam hand pockets. Back patch pocket. Chuck Taylor patch placed at the left leg. 100 percent polyester. Machine wash and tumble dry. Imported. Measurements: Waist Measurement: 24 in Outseam: 14 in Inseam: 5 in Front Rise: 9 1 2 in Back Rise: 12 in Leg Opening: 8 in Product measurements were taken using size SM (7-8 Big Kids). Please note that measurements may vary by size. 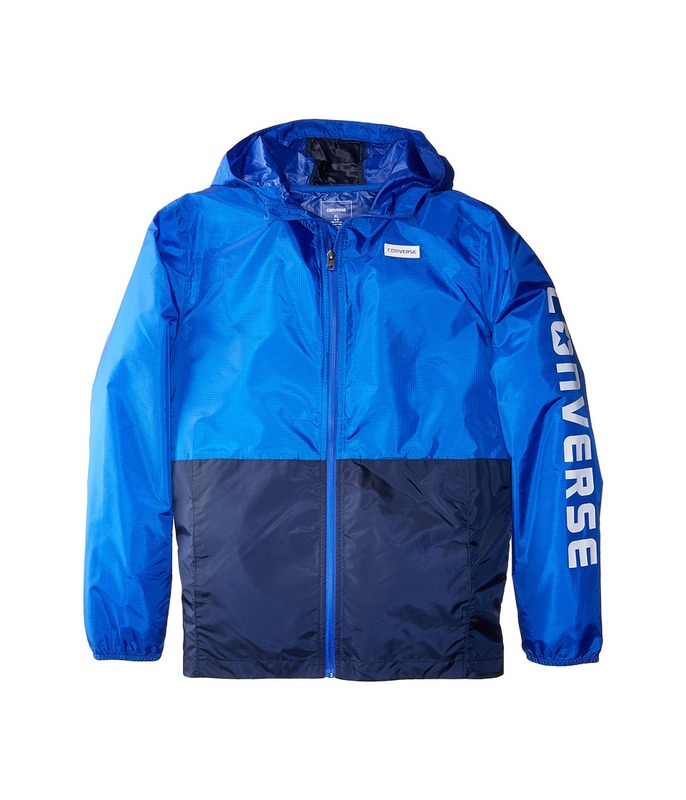 Move like a flash through inclement weather in the Converse Kids Blur 2.0 Jacket. Lightweight jacket provides wind-resistant, water-resistant protection. Mechanical stretch improves mobility. Attached, three-piece hood. Full-length zip with inner draft flap. Long sleeves with elastic cuffs. Zip chest pocket. Straight hemline. 100 percent polyester. Machine wash, tumble dry. Imported. Measurements: Length: 27 in Product measurements were taken using size XL (16 Big Kids). Please note that measurements may vary by size. 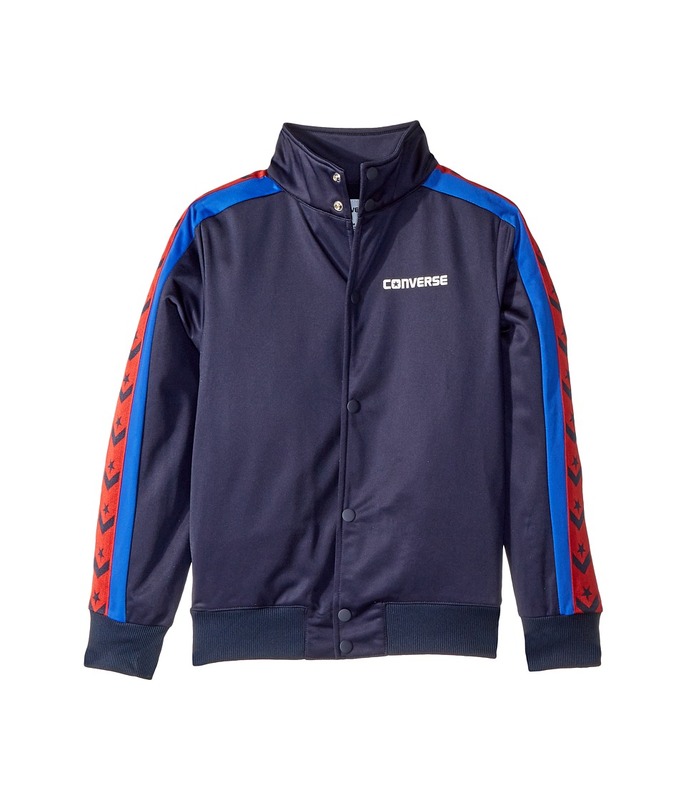 Get throwback cool from the gym to the streets in the Converse Kids Heritage Warmup Bomber. Classic bomber jacket in a warm fleece knit. Mock neck. Full-length zip. Flat hand pockets. Rib-knit cuffs and hem. 100 percent polyester. Machine wash, tumble dry. Imported. Measurements: Length: 24 in Product measurements were taken using size MD (10 Big Kids). Please note that measurements may vary by size. Throwback cool for the sporty set! 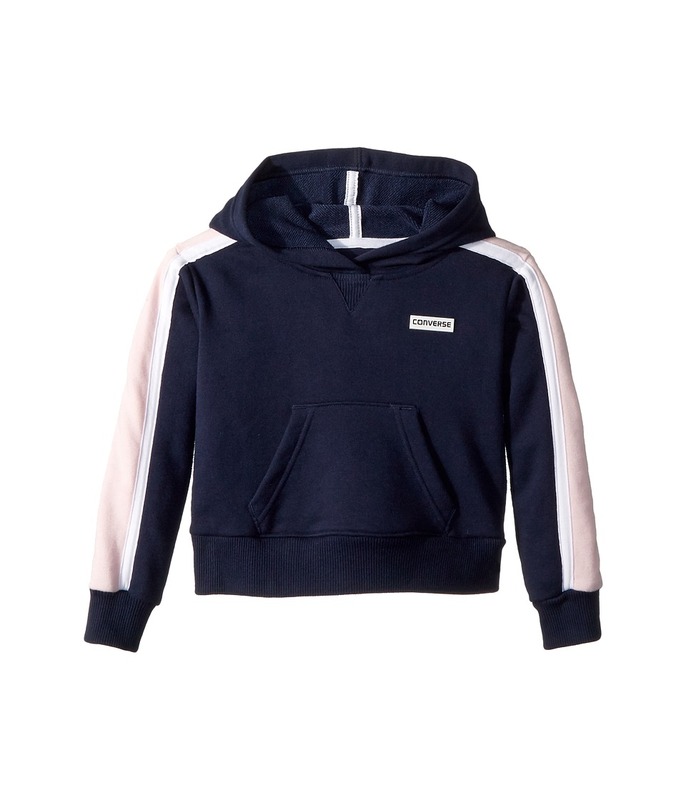 Live those vintage vibes in the Converse Kids Retro Trim Cropped Pullover. Pullover hoodie in a boxy fit and cropped length. Brushed-back fleece with bold, two-tone stripes down the sleeves. Attached hood with lap front and V-panel neckline. Long sleeves with dropped shoulders. Kangaroo hand pocket. Banded cuffs and hem. Logo detail at the chest. 100 percent cotton. Machine wash and tumble dry. Imported. Measurements: Length: 13 in Product measurements were taken using size 4 Little Kids. Please note that measurements may vary by size. 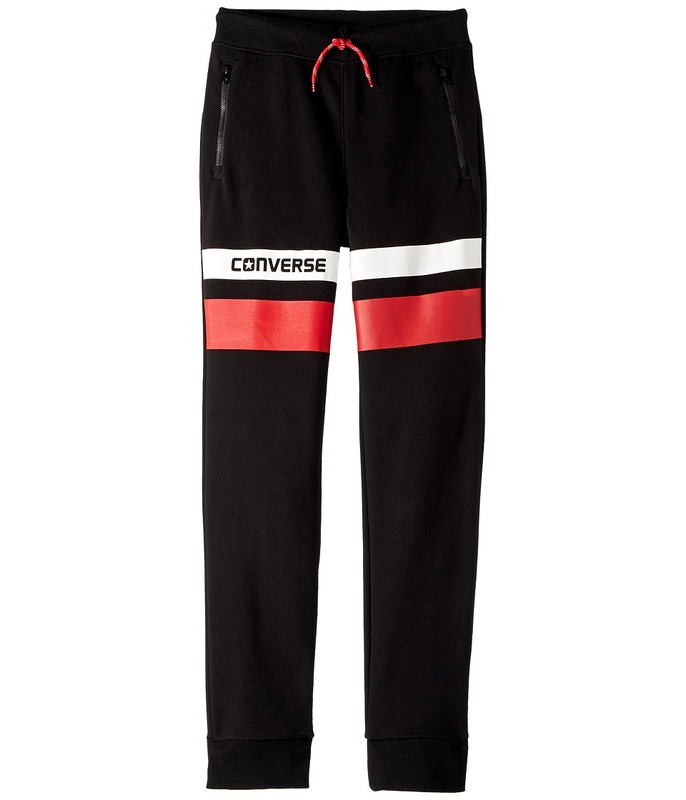 Get throwback cool from the gym to the streets in the Converse Kids Heritage Warmup Pants. Fleece joggers feature a loose fit that tapers through the leg. Rib-knit waistband with faux drawstring. Flat hand pockets. Back patch pocket. Gathered rib-knit cuffs. 100 percent polyester. Machine wash, tumble dry. Imported. Measurements: Waist Measurement: 19 in Outseam: 24 in Inseam: 18 in Front Rise: 8 in Back Rise: 9 1 2 in Leg Opening: 9 in Product measurements were taken using size 5 Little Kids. Please note that measurements may vary by size. 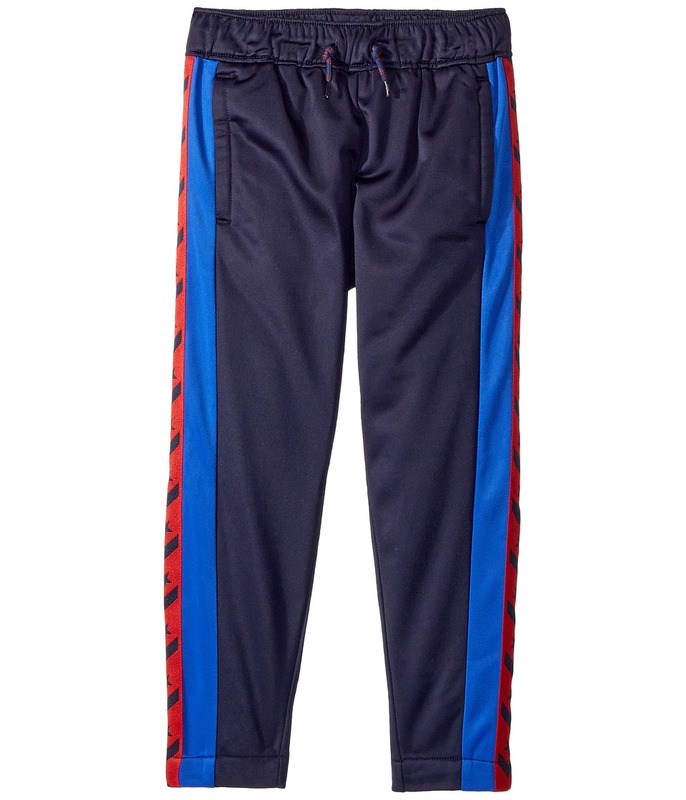 Get throwback cool from the gym to the streets in the Converse Kids Heritage Warmup Pants. Fleece joggers feature a loose fit that tapers through the leg. Rib-knit waistband with faux drawstring. Flat hand pockets. Back patch pocket. Gathered rib-knit cuffs. 100 percent polyester. Machine wash, tumble dry. Imported. Measurements: Waist Measurement: 24 in Outseam: 35 in Inseam: 26 in Front Rise: 10 in Back Rise: 12 1 2 in Leg Opening: 9 in Product measurements were taken using size MD (10 Big Kids). Please note that measurements may vary by size. 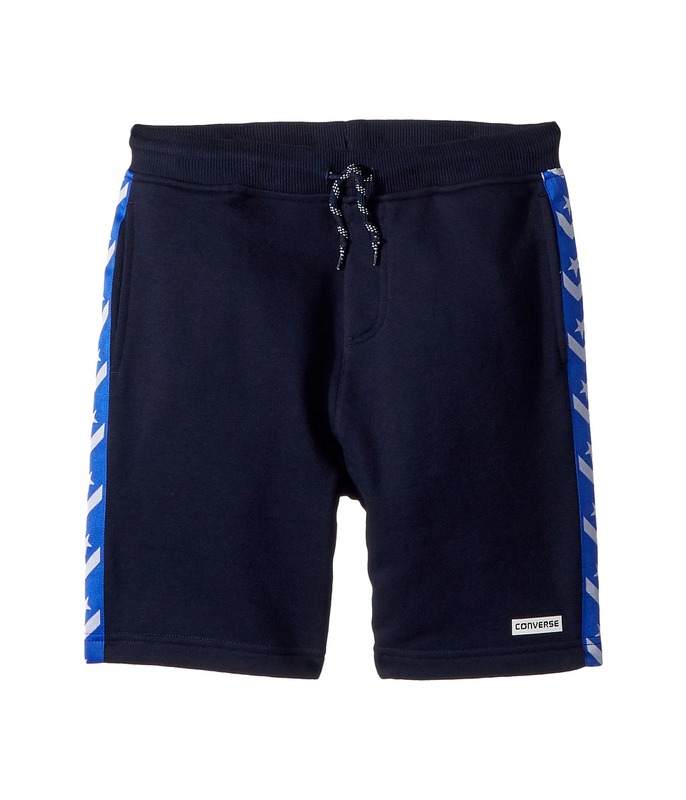 The Converse Kids Star Chevron Knit Shorts are all about style and comfort. Signature Star Chevron logo sets off the grosgrain stripes down the side seams. Rib-knit waist with drawstring detail. On-seam hand pockets. Back patch pocket. Logo hit at the left leg. 55 percent cotton, 45 percent polyester. Machine wash, tumble dry. Imported. Measurements: Waist Measurement: 18 in Outseam: 11 in Inseam: 4 in Front Rise: 8 in Back Rise: 9 in Leg Opening: 13 in Product measurements were taken using size 5 Little Kids. Please note that measurements may vary by size. Pull-on shorts in a comfortable fleece knit. Signature Star Chevron logo sets off the grosgrain stripes down the side seams. Rib-knit waist with drawstring detail. On-seam hand pockets. Back patch pocket. Logo hit at the left leg. 55 percent cotton, 45 percent polyester. Machine wash, tumble dry. Imported. Measurements: Waist Measurement: 28 in Outseam: 17 1 4 in Inseam: 7 1 2 in Front Rise: 11 1 4 in Back Rise: 14 1 4 in Leg Opening: 10 in Product measurements were taken using size LG (12-14 Big Kids). Please note that measurements may vary by size. 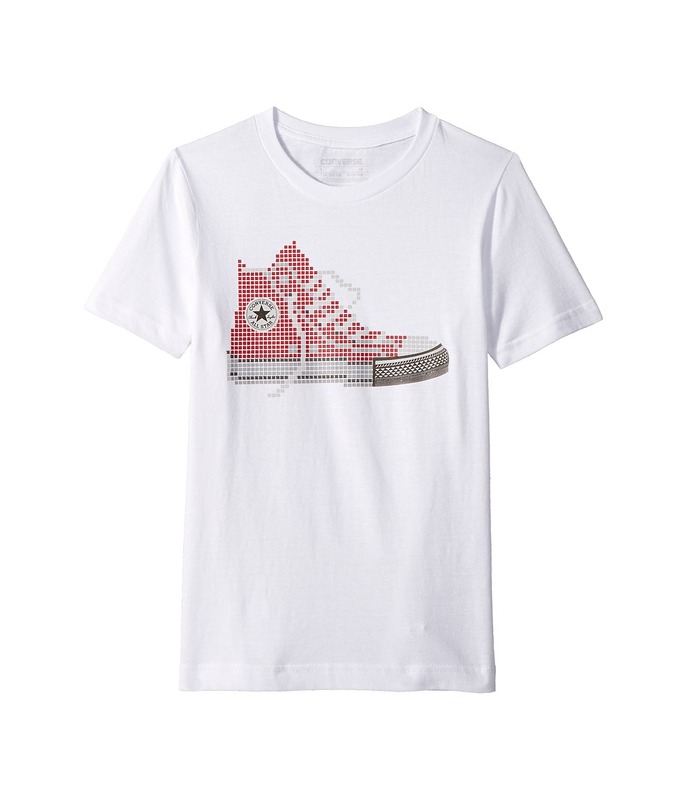 Revel in the vintage vibes of the Converse Kids Retro Throwback Chuck Patch Tee. Pullover T-shirt in comfortable jersey knit. Retro Chuck Taylor patch print at the front. Crew neck. Short sleeves. Straight hemline. 60 percent cotton, 40 percent polyester. Machine wash, tumble dry. Imported. Measurements: Length: 21 1 2 in Product measurements were taken using size MD (10 Big Kids). Please note that measurements may vary by size.